Choosing the right coffee machine...traditional or single-serve? French press, single serve, or drip brewer? If you’re in the market for a new coffee machine, there are certainly plenty of choices right now. It used to be that most of us went out and purchased a new drip brewer with paper filters. Another option was the always dependable French press. But during the last couple of years a new type of coffee maker has arrived on the market – single cup brewers. 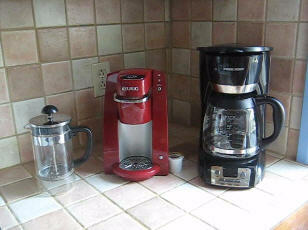 Which kind of coffee maker is right for you? Different types of brewers have different strengths and weaknesses. Traditional drip coffee makers do a fine job, and you can choose between machines that make anything between about 5 and 10 cups of coffee at a time. If there are two or more coffee drinkers in your family, and you all like a quick caffeine fix in the morning, a drip brewer might be just the right choice for you. One other advantage of drip coffee makers is that you are free to buy any kind of coffee bean, grind them yourself, and enjoy the broadest possible range of blends and single origin coffees. The same goes for the French press. Choose any coffee type you like, grind the beans and use your press to make the coffee. So what about single cup brewers? Single cup brewers offer an entirely different approach. These are the latest type of coffee machine to hit the market and are becoming hugely popular. The principal advantage is that you can make just one cup of coffee at a time. Using a Keurig Brewer, for example, you simply add water to the reservoir, and one K-Cup to the machine - and a few seconds later you have a fresh, hot cup of gourmet coffee. It’s perfect for anyone who wants a single cup of coffee from time to time during the day, and doesn’t want to have to deal with grinding beans, pouring ground coffee into the filter or cleaning their coffee machine afterwards. With the K-Cup, you simply make your coffee and then throw away the used K-Cup. No cleaning required. Disadvantages? There are a couple. First, you will be more limited in your choice of coffees. Not every coffee you can buy as whole beans is available in K-Cups. But about 30 different coffees come in this format now, so you still have a pretty wide selection to choose from. Also, each cup of coffee will cost you a lot more. The convenience of a Keurig coffee machine, and other single serve brewers, comes with a price. But if you like the idea of making just one cup at a time, the extra cost may not trouble you too much. There are other single-cup formats, like coffee pod machines and T-Disc machines. But the Keurig brewers seem to be the most popular right now.